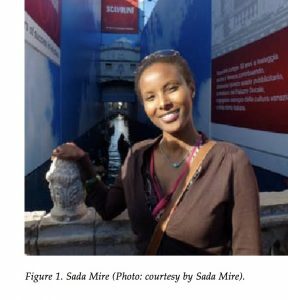 This interview with Sada Mire starts with the history and legacy of European archaeological practices in Somalia, arguing how it has contributed to a situation in which archaeology is viewed by many Somalis as a distant, foreign phenomenon. Touching upon her personal experiences as a Somali-born Swedish archaeologist, living and working in the UK and Somaliland, the interview then delves deeper into the need for preserving knowledge and promoting community engagement and training as a way forward, ultimately arguing how cultural heritage and archaeological knowledge should be regarded as a basic human need. The paper ends with a discussion on the potential of collaborative practices in terms of bringing communities more closely together. Read full chapter (OPEN ACCESS): S.J. van der Linde & M.H. van den Dries (2012), Preserving Knowledge as a Basic Human Need: on the History of European Archaeological Practices and the Future of Somali Archaeology. An Interview with Sada Mire.. In: S.J. van der Linde, M.H. van den Dries, N. Schlanger and C.G. Slappendel (Eds.) European Archaeology Abroad: Global Settings, Comparative Perspectives.European Archaeology Abroad: Global Settings, Comparative Perspectives. Leiden: Sidestone Press Leiden: Sidestone Press. 375-387.